There was no one to receive him in 1914s when he arrived. But within 15 years, the whole nation followed him from villages to villages! Just think about it, millions of people, of various religions, of various ethnicities following a guy who they had no idea if existed 15 years back. And all this popularity, when there was no means of mass communication, no radio, no tv, nothing ! All the major newspaper tried not to cover his story under force of britishers. If under such circumstances, that guy can make million followers, just think about his capabilities. No person in the history of world, had these many followers in such a short time! No one ever! Think about it! Good evening everyone, since Independence day is few days away, I couldn’t resist myself from talking about the person changed future of this subcontinent for all !
. There is no better time to talk about the Mahatma than now when too many half-baked Indians are having misconceptions about the Mahatma. In the age of social media, it’s a culture to make fun of people, I have no prob with the memes and all, but the fact the British students know more about Gandhi than we indian do, saddens me deeply. With this speech I will try to answer some general bogus claims which are popular nowadays. We all know about the so called first war of independence of 1857, it failed, you know why? Because the common indian didn’t participate ! You must be wondering , why didn’t they? But it never happened, the reason being was that common Indians didn’t feel much difference, they were being exploited in the same way just like they were by aurangjeb etc before the britishers! So why will someone protest, when the protest will have no impact on their livelihood. In 1857, the kings and the queens felt exploited by the britishers, afterall they had to pay taxes to british india company, they all revolted together. But, ! they didn’t fight for independence of india, they fought independence of their princely states. If they had won in 1857, India won’t have actually existed! Hundreds of small countries would be there in place of India. Gandhi knew that Indians will easily get freedom, and the world wars 1 & 2 made sure that the britishers would be leaving. Gandhi wanted to weave a nation ! A nation where all communities can live together where every religion respects other religion, for him actual freedom was unification of india ! All his non-violence tactics, all this hunger strikes was something every indian could relate to, he weaved all the communities into one which otherwise would have fought for separate countries ! Gandhi wanted britishers to declare independence only when all people of india start recognising themselves as Indians! Without him we would still have had freedom, but not as one country but as several countries. The thing is britishers were really clever, they made sure that common Indians don’t rise against them together, as it would have made them run for their life ! They did sent Gandhi to jail but for small time, they knew it could have lead to an uprising ! Hence they tried to avoid conflicting with Gandhi. Definitely he could have, he could have just said to his followers, ‘attack that jail’ and within few hours bhagat singh would be free. But was it possible without violence? Gandhi fought against violence throughout his life, saving Bhagat singh would have ended the very morals he made the people believe in. Bogus Claim 4; Gandhi loved Pakistan & that’s why he didn’t join the first session of parliament at midnight. The creating of Pakistan was biggest blow for Gandhi, he fought for 30 years to unite Indians and yet few politicians created two nations to full fill their ego. At the midnight of independence, 14aug1947 gandhi was in a hut in a small village of west Bengal, trying to settle peace in riot hit Bengal. 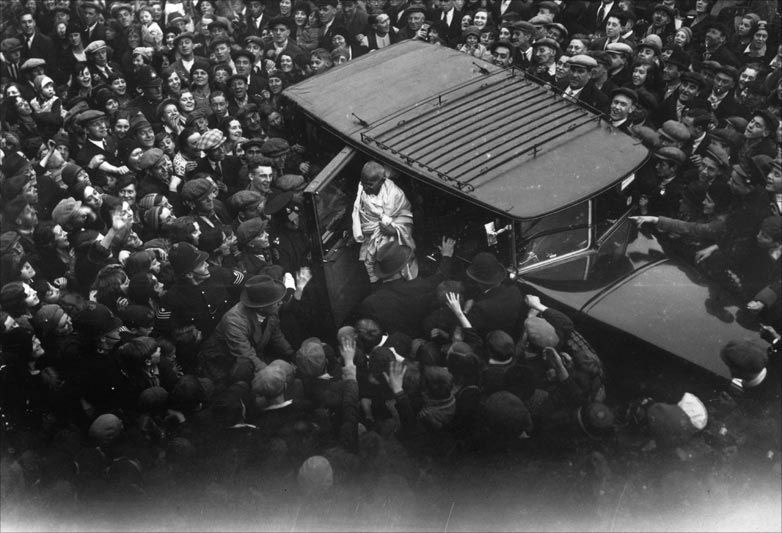 During the end of his life, Gandhi was travelling to places to stop hindu-muslim riots. It is said that, Gandhi saved millions of lifes in Bengal which otherwise would have died due to riots. Gandhi would go in riot hit places , people would stop rioting and would sit together to listen to him! As if he casted some magic spell. Gandhi could have been the first president, the first PM, the first bharat ratna recipient but he denied everything ! Today, if we are here, In a democratic country, free to give our opinions, is because of one man called Gandhi. It’s great that you are so regular in blogging , I write once in months -_- , have 40+ books to review ! I also don’t get time …. Did you see my latest post ?? ?it’s on reading !! Very informative. Thanks. I learned more about Gandhi from this post. I found this blog interesting in light of another leader who recently found millions of followers very quickly. The two are on different paths, or are they? They both have their views of their nation guide them. and commemorating on this eve makes it more special !! Thanks for posting this. Our family recently read a picture book about Gandhi and I found it very interesting to learn more information. You cleared a couple of misconception through this. Too good!